So, yesterday I turned 21, YAY! *does happy dance*. So, I thought I would celebrate by tell everyone 21 facts about me, so here we go:- 1) My favourite colours are pink and blue. 2) I have two cats, a girl and a boy. 3) I love pizza. It should be one of our five-a-day. Seriously...who doesn't love pizza?! 4) My middle name is Kate. (I keep my last-name out of it, 'cause Sophie Kate is much less of a mouthful than my full name.) 5) My favourite YA author would have to be Veronica Roth. 6) Blogging must run in the family, as my sister also runs a YA blog called Pretty Little Memoirs. 7) I have over 300 books, which I am slowly working my way through...this may take a while. 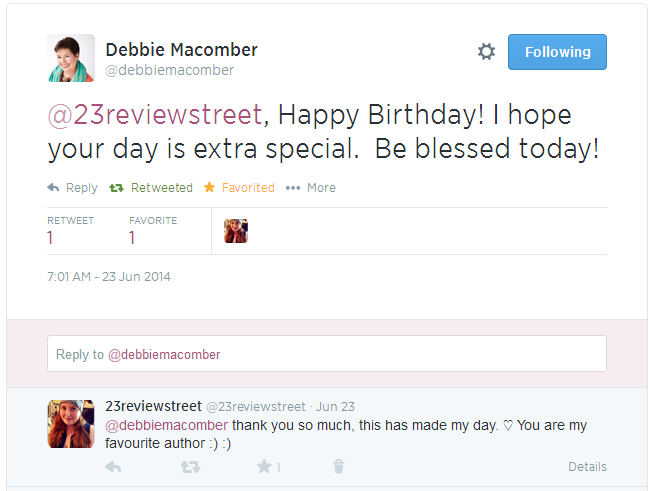 8) My favourite author is Debbie Macomber. 9) My favourite books are Hannah's List by Debbie Macomber and Safe Haven by Nicholas Sparks. 10) It was Hannah's List and Safe Haven that made me want to start blogging in the first place, so I could tell people how much I loved books and what I thought of them. 11) My favourite TV shows are NCIS:LA, NCIS, Pretty Little Liars, Teen Wolf, and so many more that it would take me forever to name them all. 12) I love cupcake themed things, which if you have seen my blog in the past then you would already know. 13) My favourite movies would have to be Safe Haven, White Chicks, Fired Up! and the Twilight movies. 14) My favourite music is Lady Antebellum, Kelly Clarkson, Daughtry, Haim and Dan & Shay. 16) I just finished studying Criminology and Criminal Justice at University. (So now you know why I love NCIS/CSI so much.) 17) I have read the entire Harry Potter series (before the films had even finished) and it's one of my favourite reading experiences so far. 18) I volunteer, and I really think it helps our community to do so. 19) My favourite song is "Chicago" by Kate Voegele. 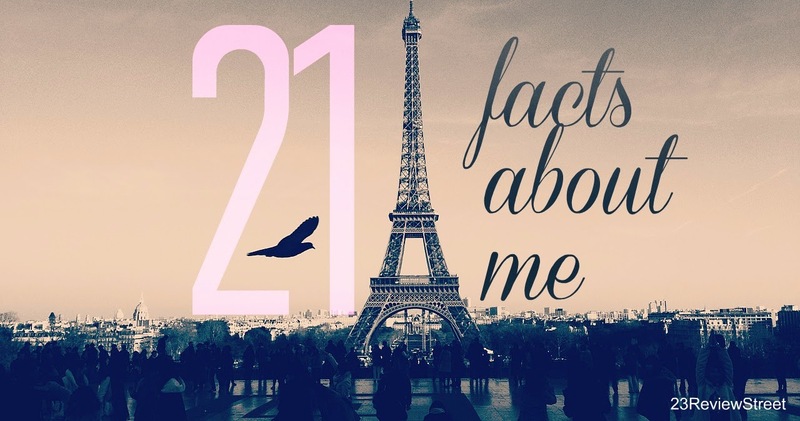 20) I love blogging. I love meeting new people and reading new books that surprise me with every one. It's one of the best things ever. 21) I'm guessing by now, you didn't realise that there was no number 15, I also bet you went back and looked. *Sorry not sorry, hehe* BUT bonus: I DO appreciate you stopping by 23 Review Street. If I could give everyone who stopped by a pound/dollar...I'd be broke. So, instead: THANK YOU! *Also* you'll never believe who said happy birthday to me! DEBBIE MACOMBER, a.k.a. my favourite author of all time. A massive thank you to Becca Jayne (Pretty Little Memoirs) who arranged it. I'll forever be thankful.